Baked Sunday Morning: Peanut Butter Chocolate Whirligigs. Whirligigs: just the name stop you to the recipe!!! Whirligigs, Whirligigs,… I can’t stop to pronounce this very weird word (probably just fun for a French girl!!!). 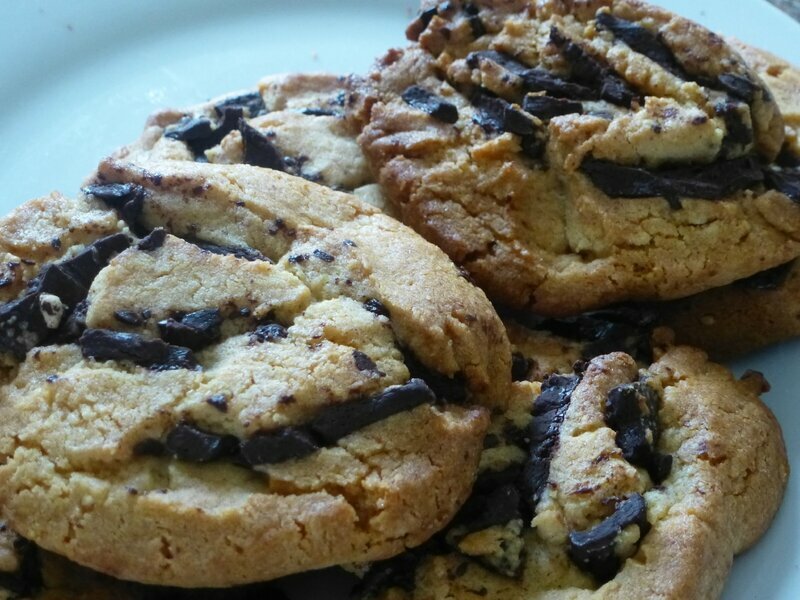 In fact, unlike their name, these cookies aren’t weird, they are just perfect. 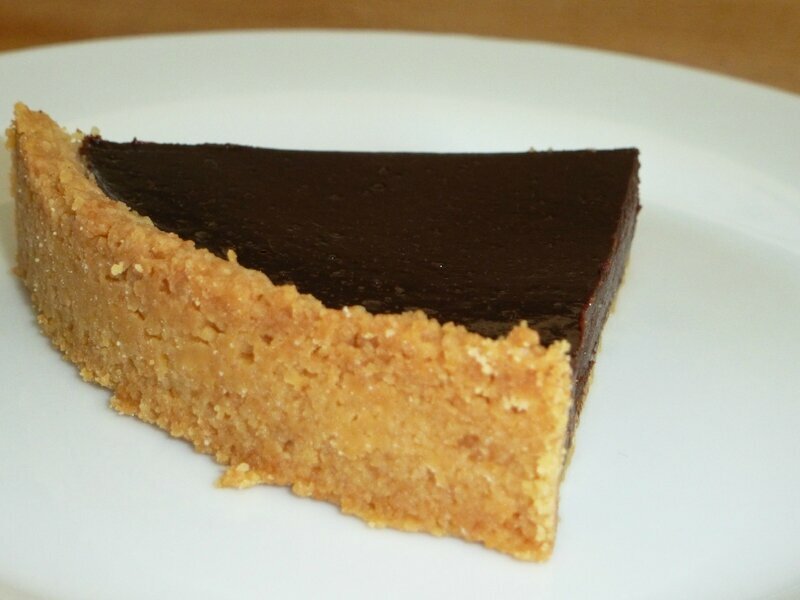 A lovely peanut butter flavor, due to the dough, and a nice strong taste of dark chocolate, due to the filling. 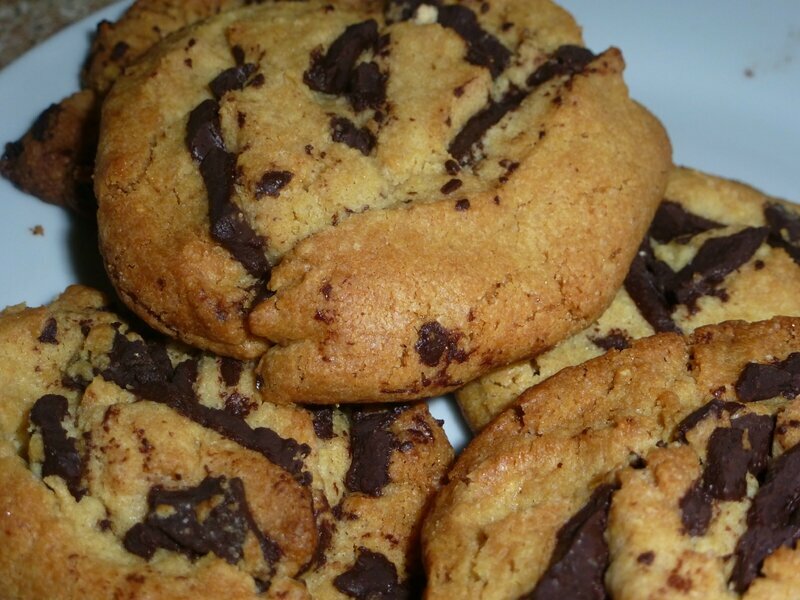 Otherwise, the recipe gives beautiful crunchy cookies, as it write in the Baked book: “dangerously addictive”, take care…. 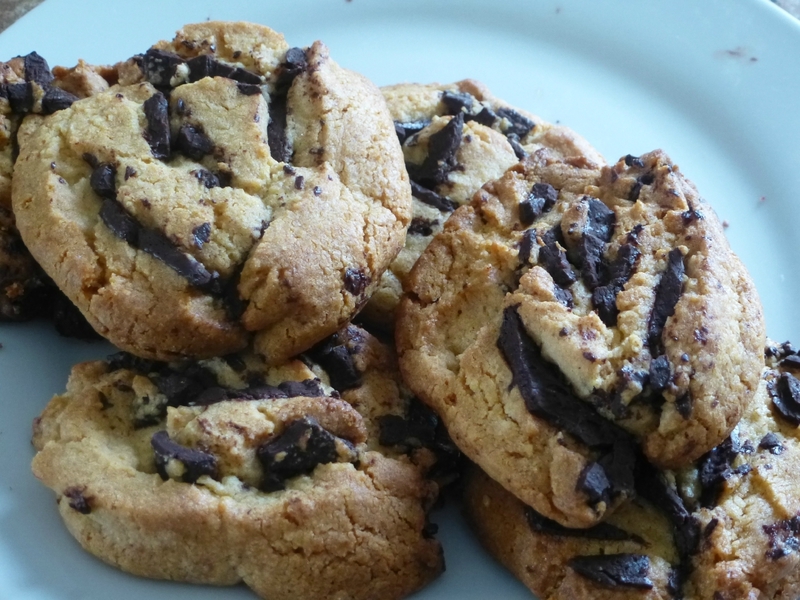 I used this cookies as the cookie bases to the Chocolate-Mascarpone Cheesecake. To see what the other members thought of the Peanut Butter Chocolate Whirligigs visit the Baked Sunday morning website. Tuesdays With Dorie – Mocha Brownie Cake. 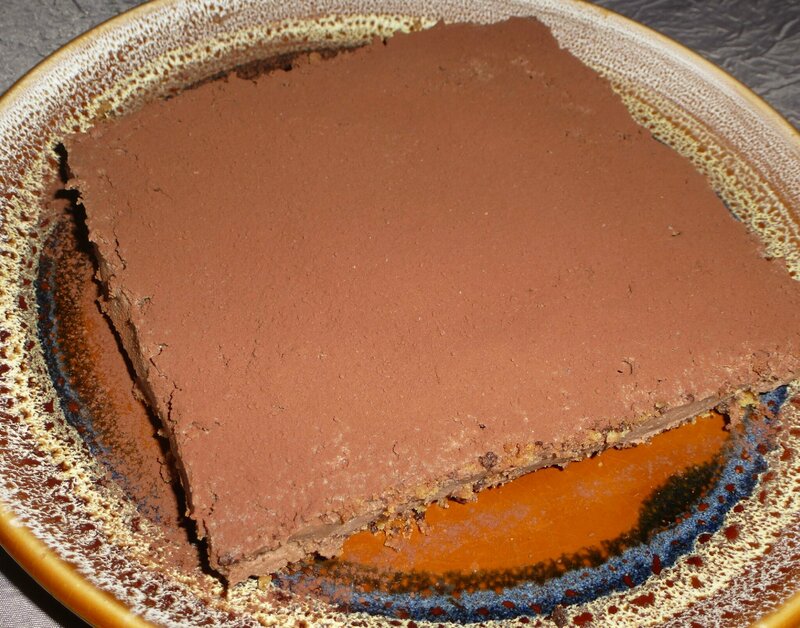 Certainly, the best chocolate dessert since for a while, and perhaps my favorite of Dorie’s book “Baking with Julia”. The recipe wasn’t very difficult, however it takes a little time. It’s divided into several parts, with resting time. For my part, everything went without trouble, and even quite easily. 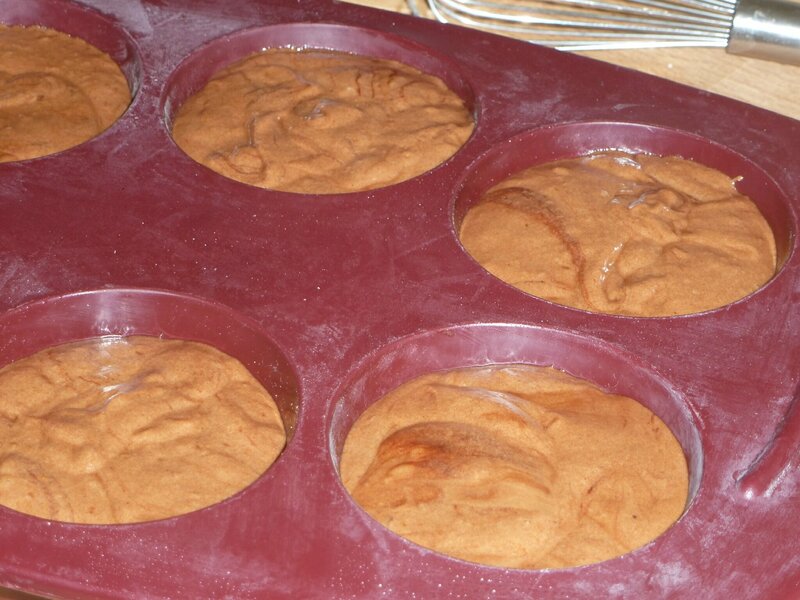 I made individual cakes, I reduced the recipe (used 2 eggs) and obtained 5 muffin size cakes. The cakes were incredibly moist, soft, chocolaty and not at all heavy. 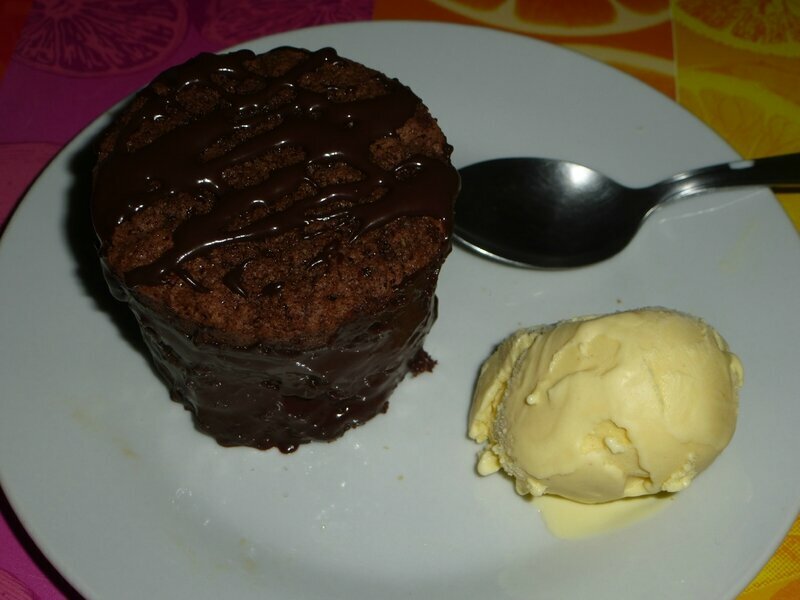 I served them with a scoop of cinnamon ice-cream (homemade, recipe below). 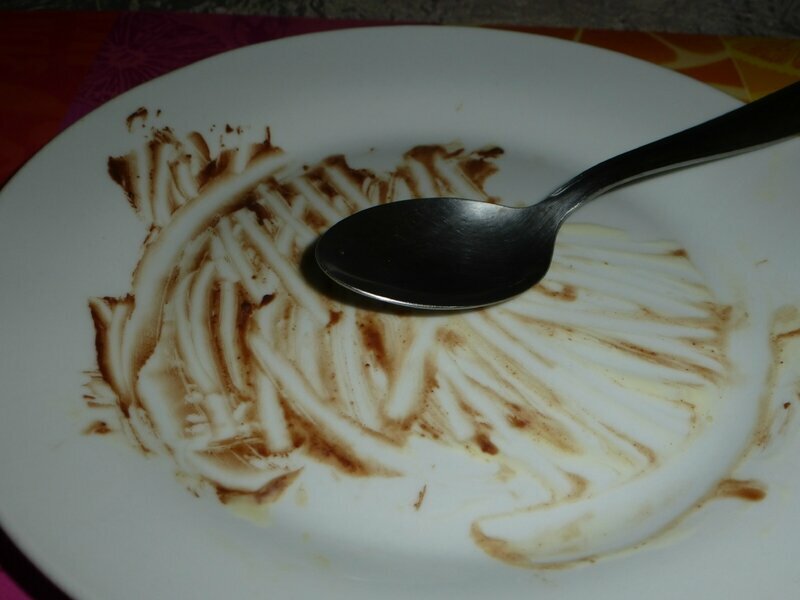 All the flavors paired beautifully, it was an amazing dessert, certainly a keeper…. 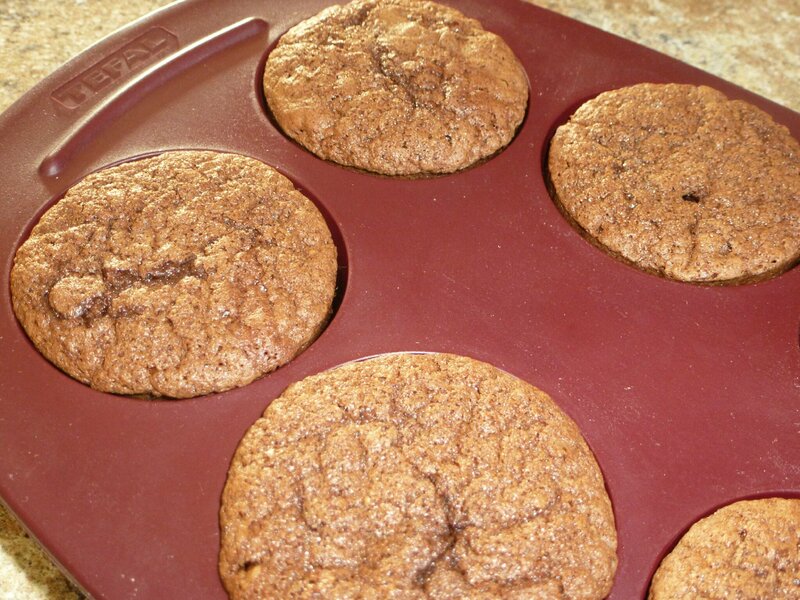 You will find the recipe in Dorie’s book “Baking with Julia” p.282/283. 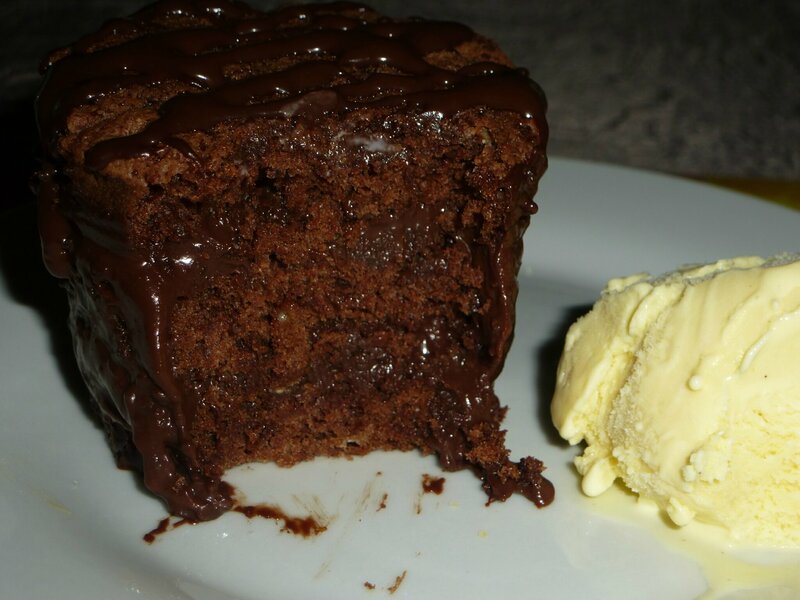 To see what the other members thought of the Mocha Brownie Cake visit the BWJ website. 1. Warm the milk, sugar, salt, cinnamon sticks and 1 cup of the heavy cream in a medium saucepan. 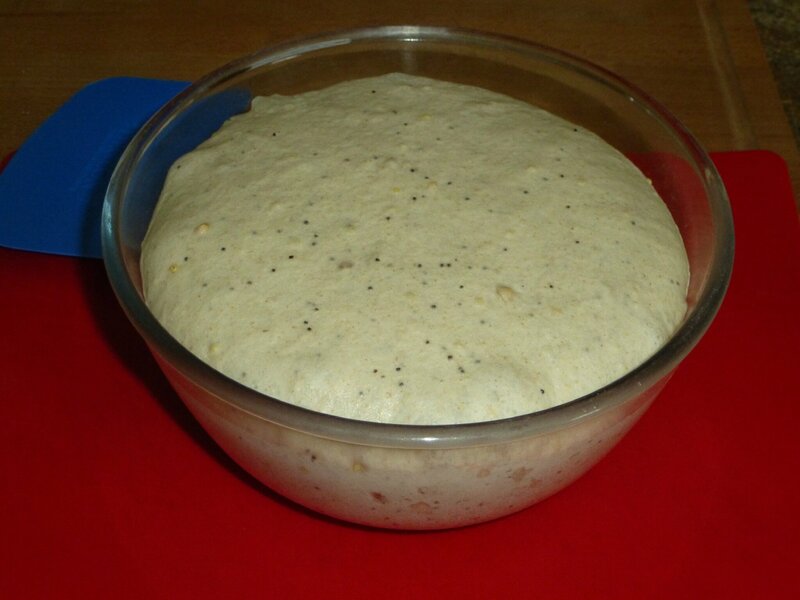 Once warm, cover, remove from the heat, and let steep at room temperature for 1 hour. 2. Rewarm the cinnamon-infused milk mixture. Remove the cinnamon sticks with a slotted spoon and discard them. 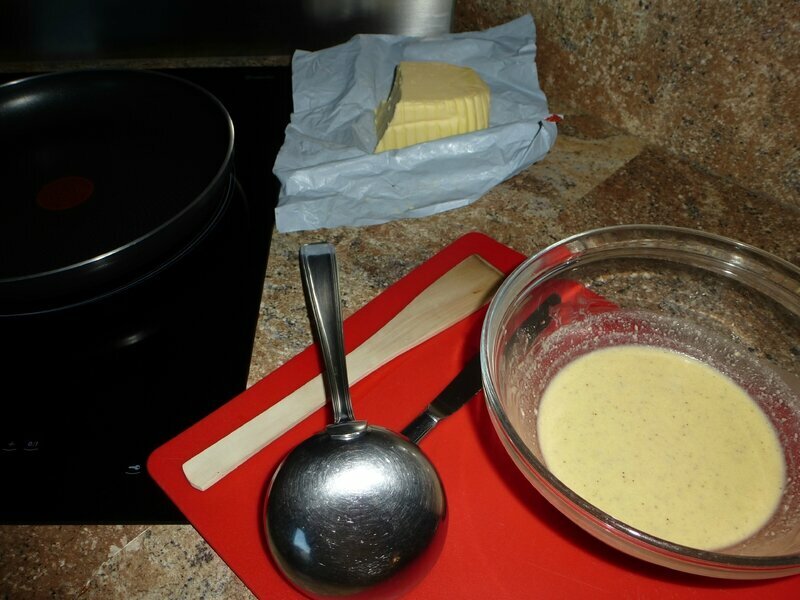 Pour the remaining 1 cup heavy cream into a large bowl and set a mesh strainer on top. 3. In a separate medium bowl, whisk together the egg yolks. 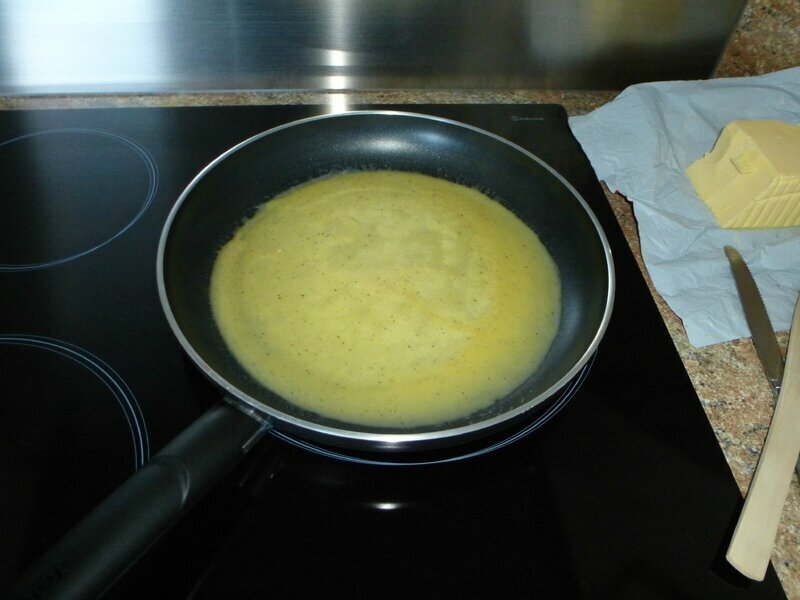 Slowly pour the warm mixture into the egg yolks, whisking constantly, then scrape the warmed egg yolks back into the saucepan. 4. Stir the mixture constantly over medium heat with a heatproof spatula, scraping the bottom as you stir, until the mixture thickens and coats the spatula (should reach 170 degrees F on an instant-read thermometer). Pour the custard through the strainer and into the cream. Stir until cool over an ice bath. 5. Chill the mixture thoroughly in the refrigerator, preferably overnight, then freeze it in your ice cream maker according to the manufacturer's directions. Baked Sunday Morning: Classic Crème Brûlée. 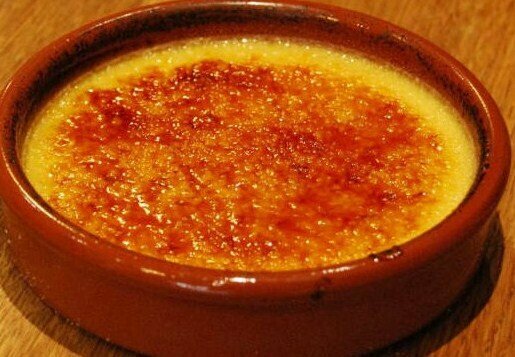 Crème Brûlée has mysterious origin, French, English and Spanish argue about it. Anyway it’s a staple in French cooking. The ingredients found in the recipes don’t vary too much: egg yolks, sugar, cream, and vanilla. 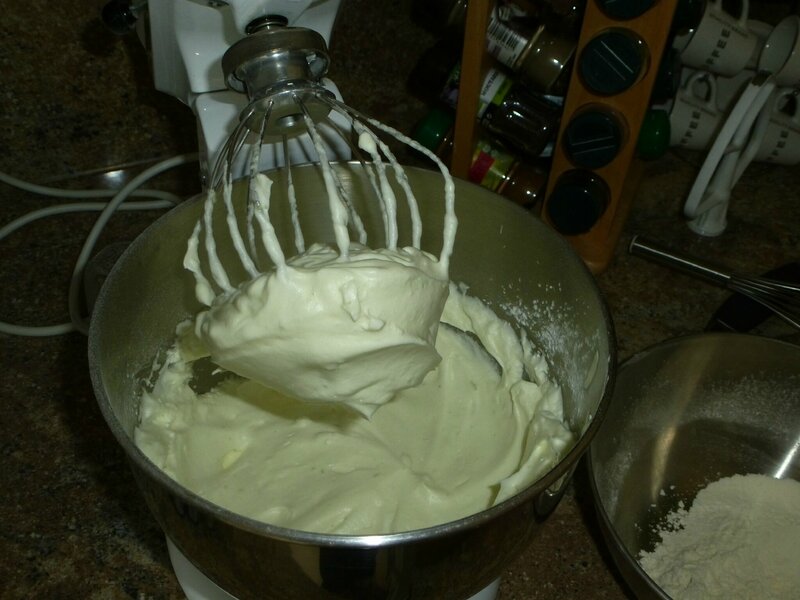 Sometimes it can be added a small amount of milk to slightly lighten the recipe. I used it and it gives a very nice result: less rich and mostly less heavy! I like to have something soft/light, which makes you want to take more, rather than the inverse. 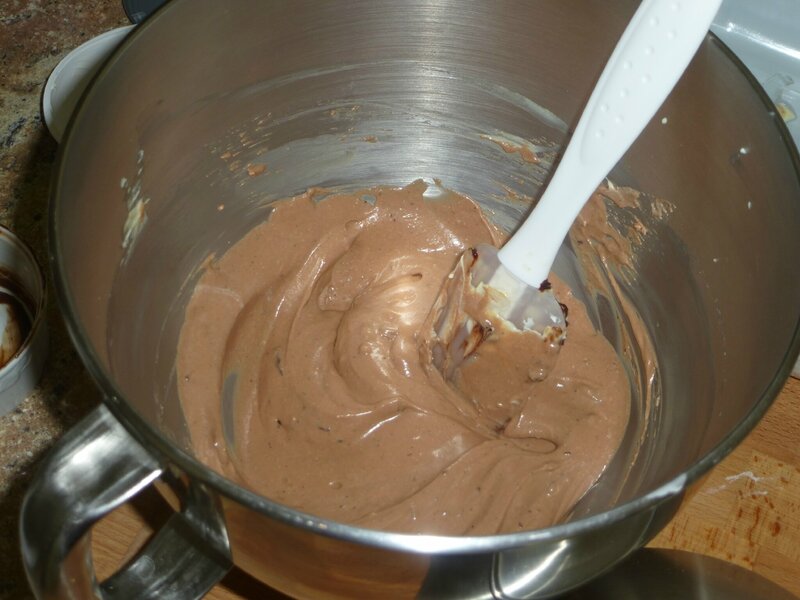 So, I almost follow this recipe, instead of 2 cups cream I used 12/3 cups and 1/3 cup milk. 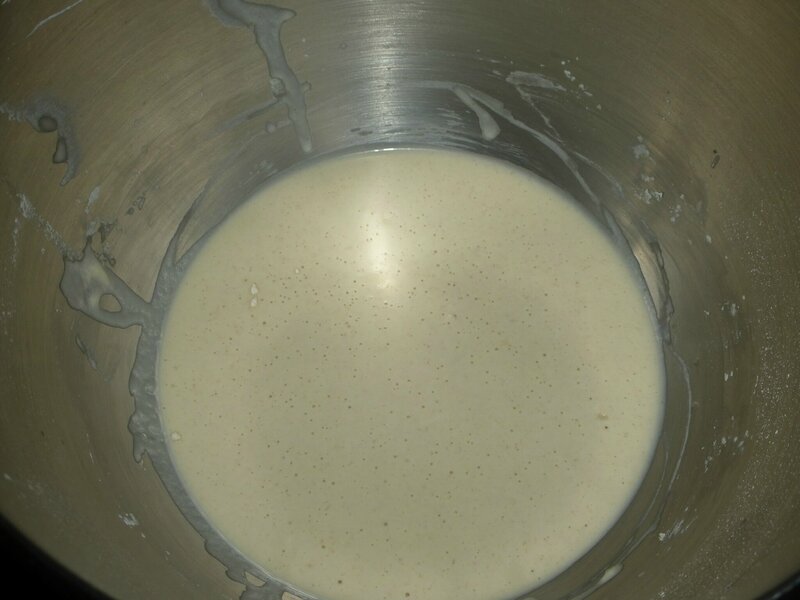 All the directions were quite easy, just be careful with the cooking time, too much and your custard turn out overcooked and for this kind of recipe it’s not great, a bite horrible. It doesn’t give the magic and the reality of this delicious dessert. I served the crème brûlée with some almond biscuits, and trust me it was AMAZING. The best crème brûlée I had ever made. Creamy with a lovely vanilla flavour and a nice sugary top. One word: delightful!!! A great reintroduction of this staple, which it can be flavored as you like: coffee, chocolate, orange, coconut, maple… so, to make and make again…. Have a look to Baked Sunday morning, to see what the other members thought about the Classic Crème Brûlée. 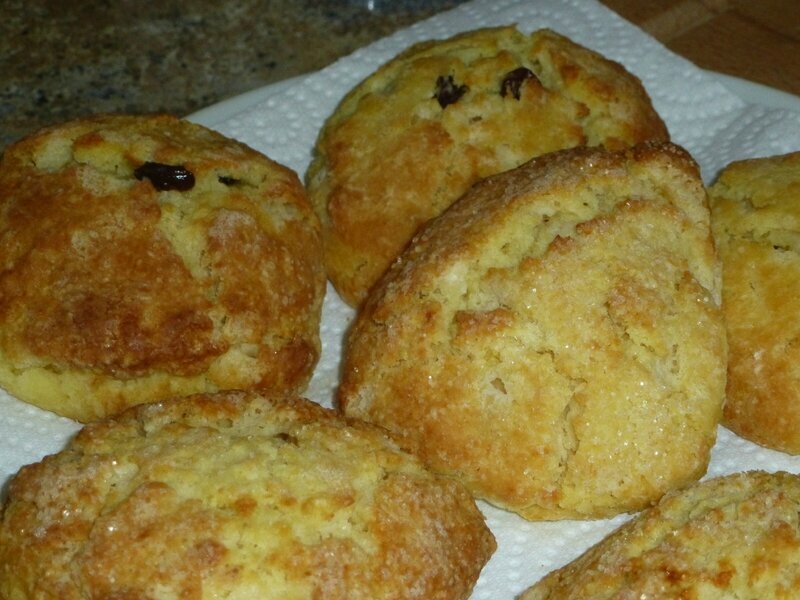 Tuesdays With Dorie – Buttermilk Scones. After the rich and creamy Chocolate-Mascarpone Cheesecake, the Buttermilk Scones were a kind of break, a lovely interlude. The recipe was really easy and very quick, with just some ingredients, usual equipments, and a sleight of hand!!! 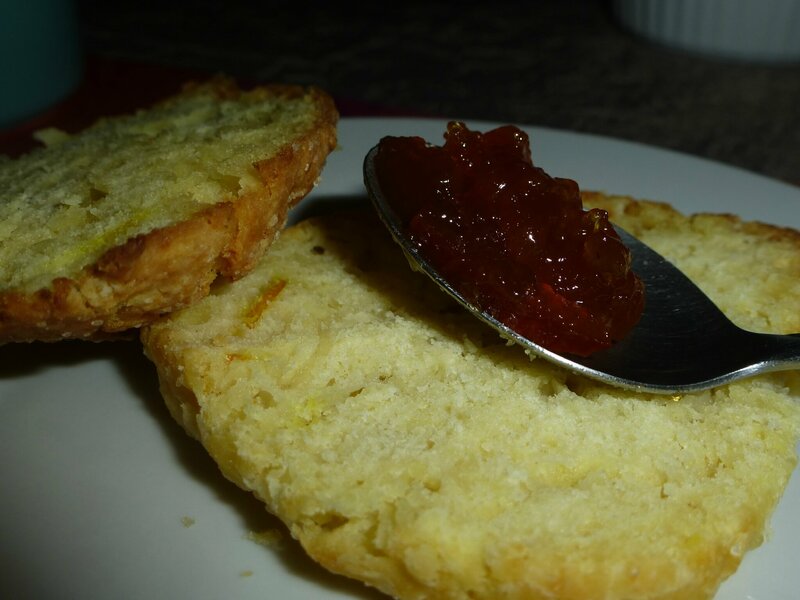 The Buttermilk Scones were perfect for a gourmet breakfast (or a nice tea-time), lightly toasted with an orange marmalade. Wonderful!!! You will find the recipe in Dorie’s book “Baking with Julia” p.210/211. 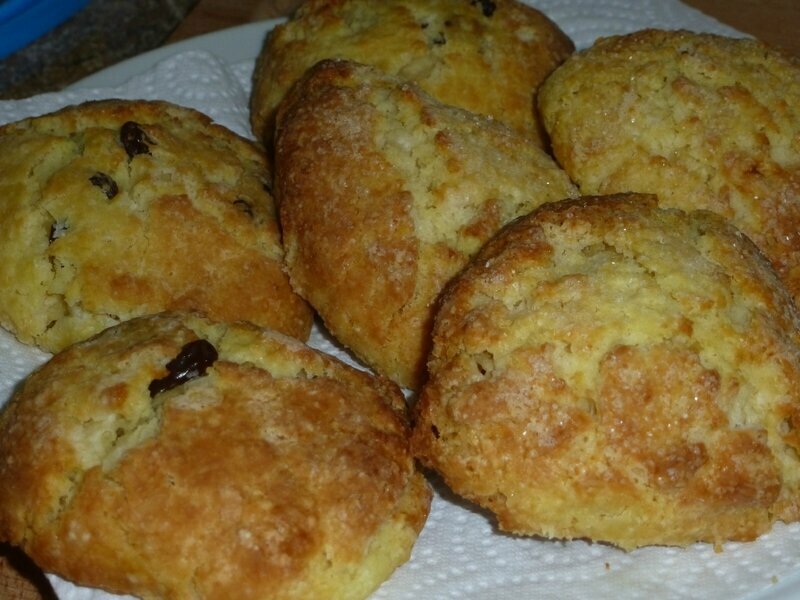 To see what the other members thought of the Buttermilk Scones visit the BWJ website. 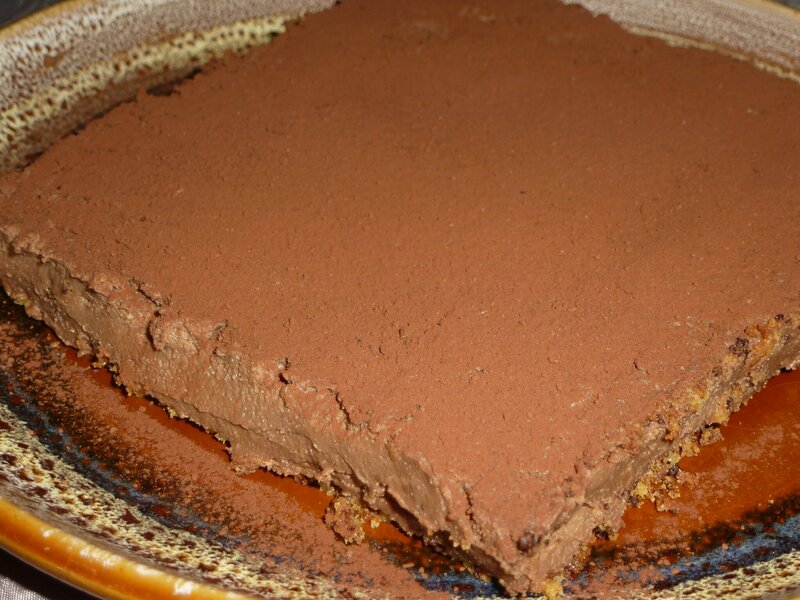 Tuesdays With Dorie – Chocolate-Mascarpone Cheesecake. Whaoo!!! 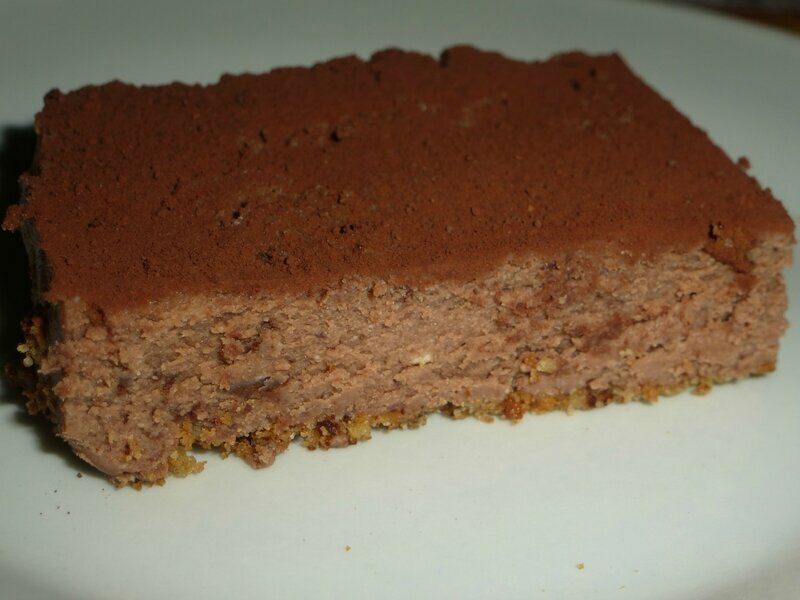 When I read that the recipe chosen for this week was a cheesecake, I was a little scared! I've never done it before!!! So it was a bit challenging this week!!!! Let’s go!!! 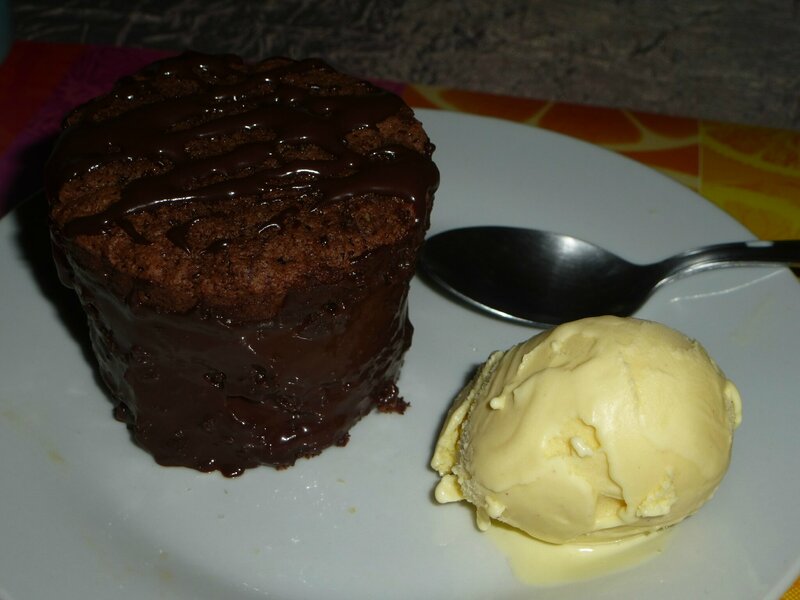 It is written: “luscious”, “chocolate”, “creamy”… Lots of words very tempting not possible to resist longer!! The batter wasn’t difficult, however the baking ask (me!!!) for a lot of attention!!!! I have some trouble with the “Bain Marie”, it’s quite difficult to control, I have to cook enough, not too much and not less, sometimes few minutes and you don’t have the good result!!! You have to stop just when it set, but not firm. Anyway, it’s not my favorite baking!! Just before serving, I dusted the cake with cocoa powder, to have a nice uniform top. Verdict: it was Wonderful!!! And not overcooked, am I suffering of cook doubting??? You will find the recipe in Dorie’s book “Baking with Julia” p.256/258. 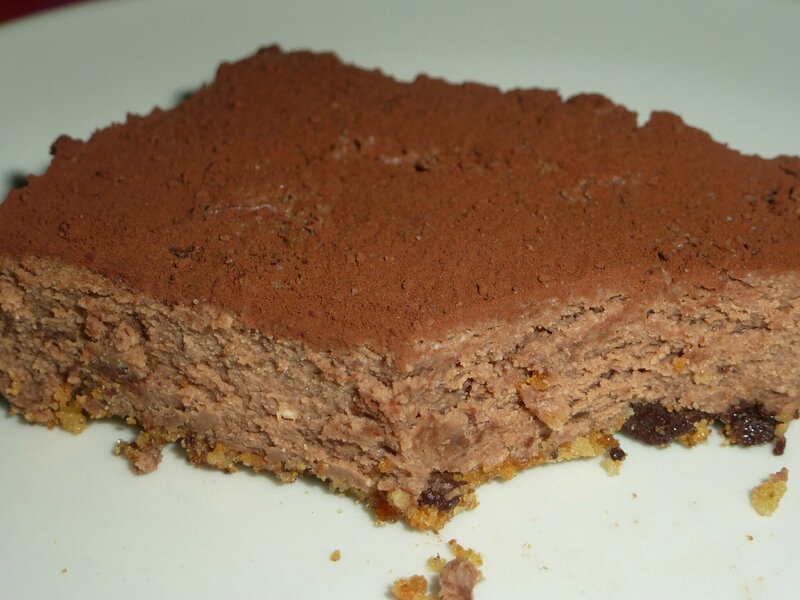 To see what the other members thought of the Chocolate-Mascarpone Cheesecake visit the BWJ website. 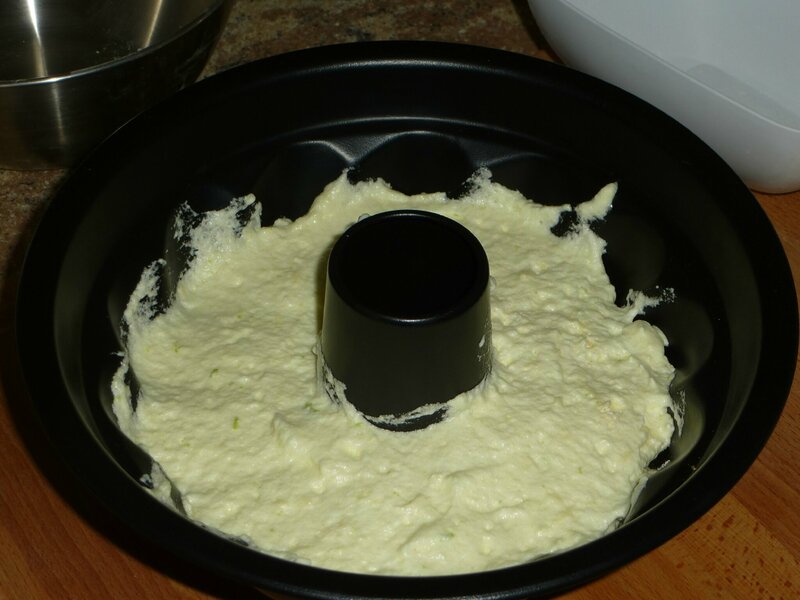 Baked Sunday Morning: Lime Angel Food Cake. 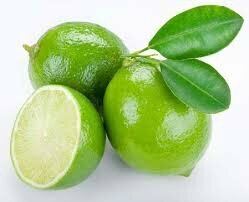 I LOVE limes. I like their fruity, tangy and beautiful floral aroma. I wasn’t a big limes accustomed, cause it wasn’t easy to buy them, two reasons: not very common on our stalls and rather expensive. Since several years, it seems that, this lovely fruit democratizes!! And good for us!!!!! So now, I never hesitate when I have the opportunity to use it!! And this Sunday is a good opportunity to prove it!!! The recipe was quite easy and didn’t require lots of ingredients!! I halved the recipe, used a bundt cake pan, and reduced the lime glaze (it was a lot of sugar for me, and I want to taste the lime). Apart that, I carefully followed all the recipe and the advices of our chiefs!!!! At first sight, the cake looks lovely, it gives a great impression!! And once in the mouth.... it's nice!!!!! 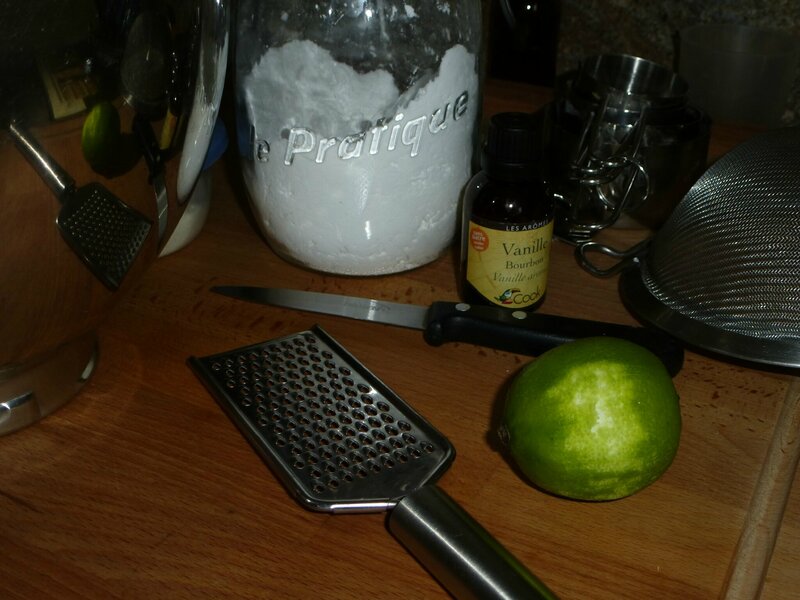 We can really taste lime, it gives a beautiful aroma, and all the flavor of the cake. It's soft, a bit spongy... 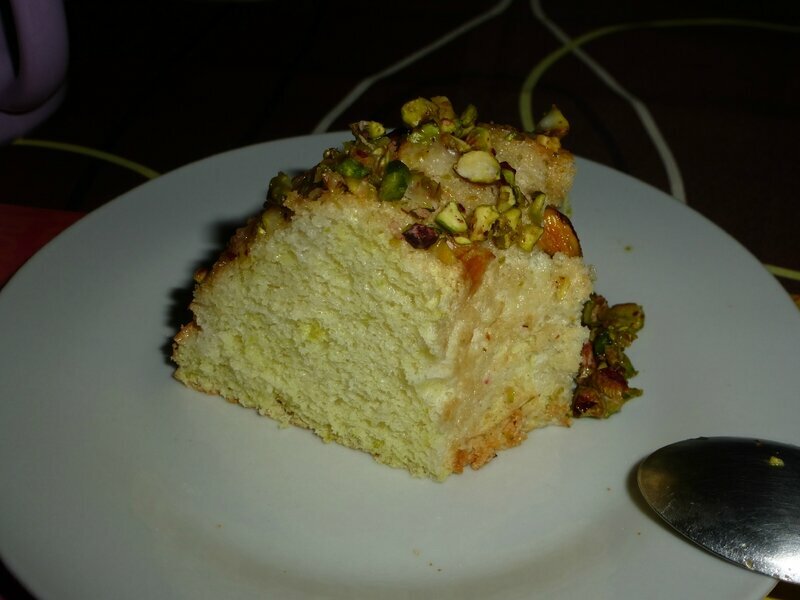 The pistachios give a little crunchy, to contrast with the cake, I didn't chopped them finely and I enjoyed it. 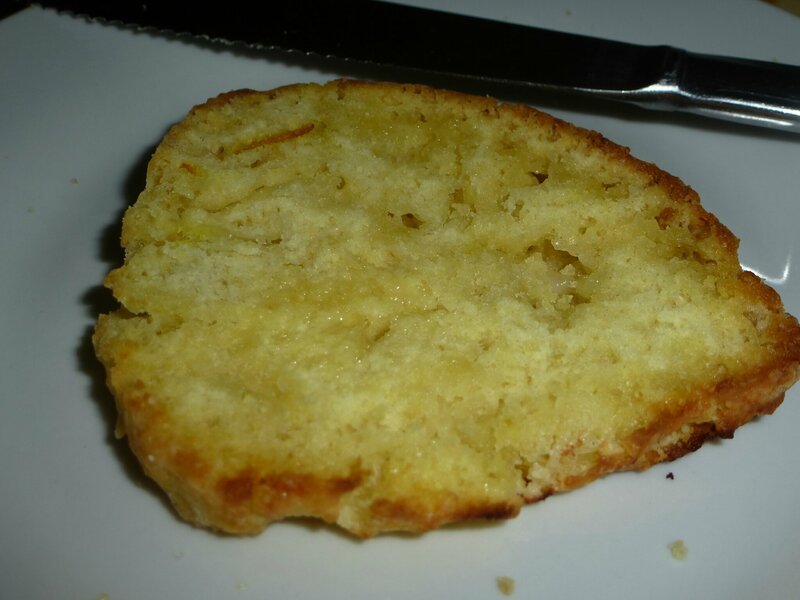 Finally, it's a good cake, probably not my favorite, but its airy lightness makes it a perfect dessert to finish a meal!! Have a look to Baked Sunday Morning, to see what the other members thought about the Lime Angel Food Cake. 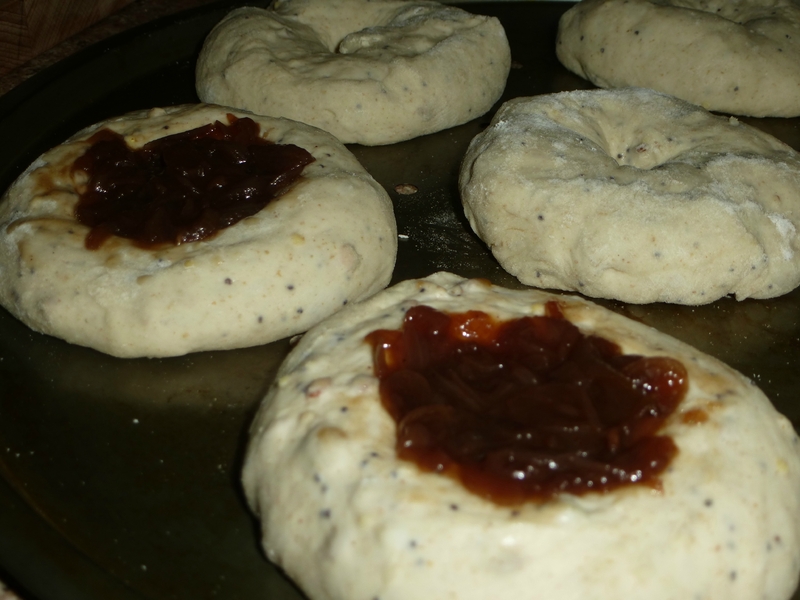 Tuesdays With Dorie – Onion Bialys. Regularly when the weather is cold and/or rainy, I like a good soup. It’s warm, comforting and healthy. 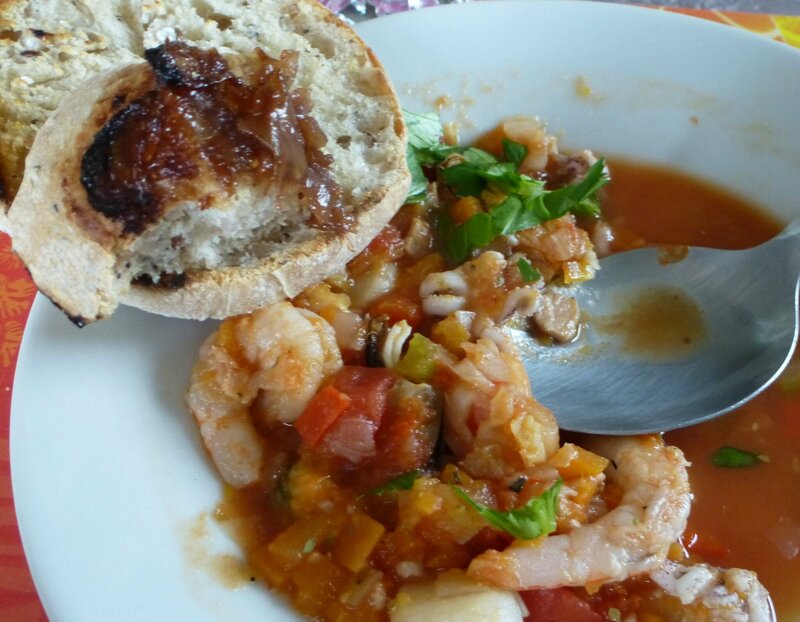 Generally, I served it with bread or roll, I change depending on the kind of soup I cook. 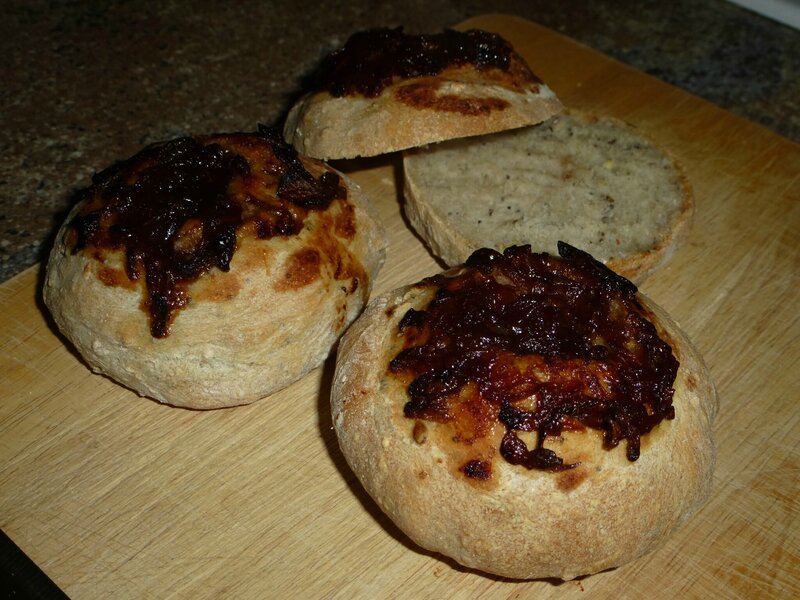 So the recipe this week: Onion Bialys, was perfect to serve with my meal. 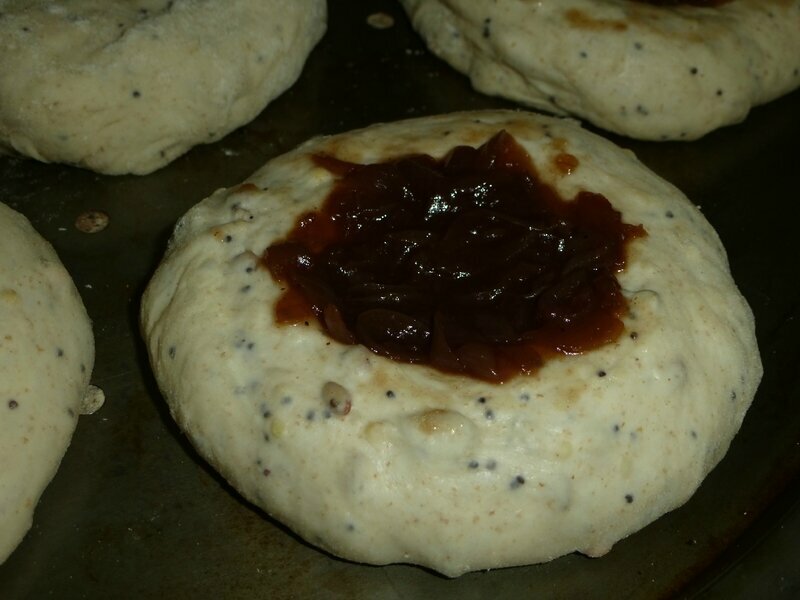 The recipe was easy to make, according to my taste, I substitute mince yellow onion in the sponge by a seed mix, and used for the topping caramelized onion instead onion/poppy seeds topping. I also halved the recipe and obtained 6 bialys, I made 3 with onion topping and 3 without, just plain bialys! However during cooking, I had a slight worry, my bialys mimics volcanoes erupting! No major damage, but the result was a little less beautiful than the picture! This hasn’t affected the taste, as recommended, I toasted them, and it was delicious, soft (more than bagels which are chewier) and the onion topping gives a very nice flavor. 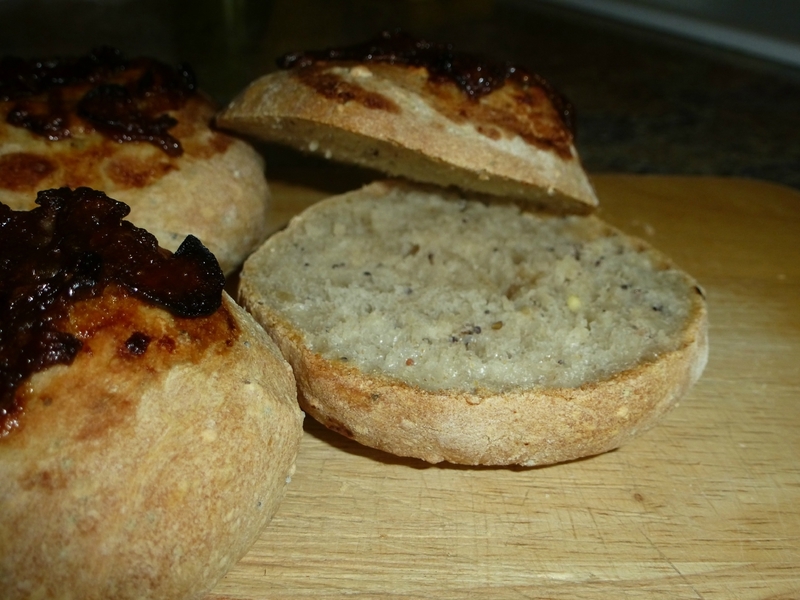 My remaining plain bialys were absolutely delicious too, I toasted them, spread a bit of butter….wonderful!!!! I‘ll definitely make them again!!!! I am also tempted to give a try for different kind of sandwiches… Anyway: a keeper!!! You will find the recipe in Dorie’s book “Baking with Julia” p.90/92. 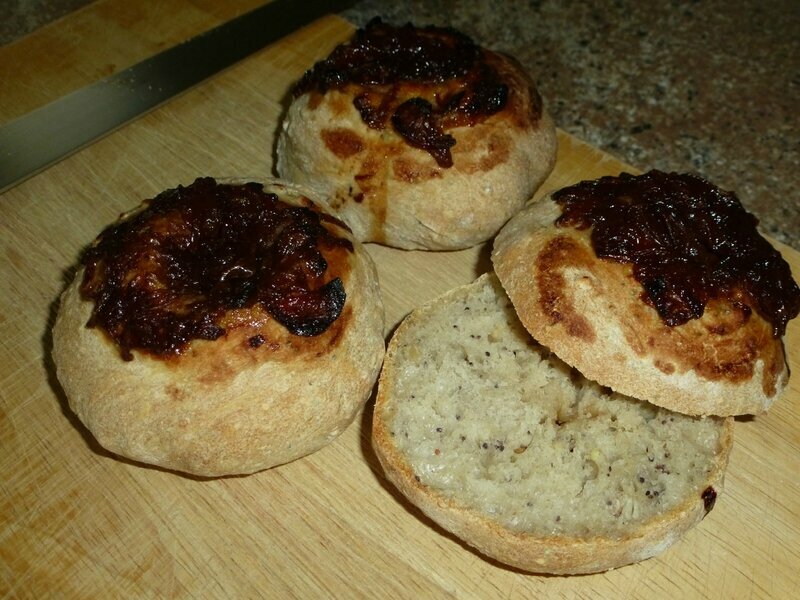 To see what the other members thought of the Onion Bialys visit the BWJ website. 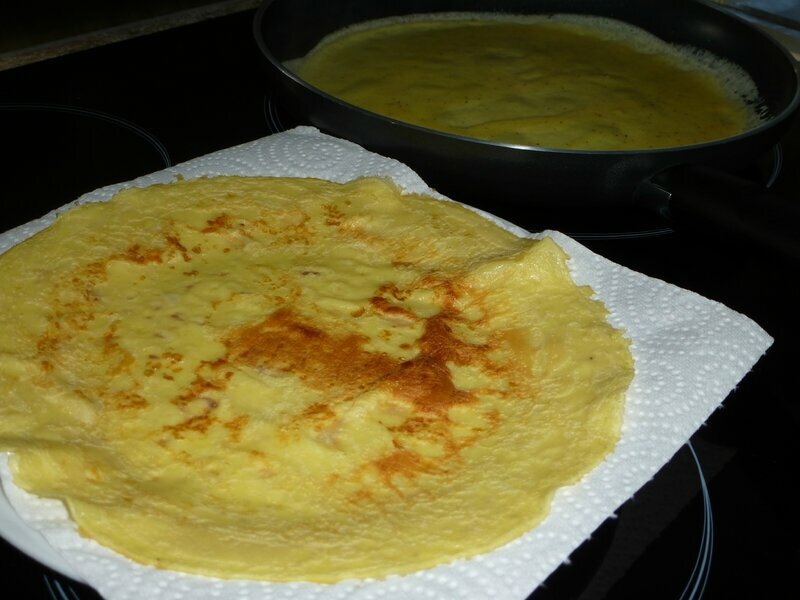 Crêpe Day: La Chandeleur (French Candlemas). Today in france it's "La Chandeleur" (French Candlemas), and I'm from a place where crêpes are a tradition, a staple, so I have to make some!!! I made a lot of different recipes and finally I discovered, tested and approved the Julia Child' recipe. This recipe is taken from her masterpiece: " Mastering the Art of French Cooking" . And I have to say that's now my go to recipe, and I don't change it for anything in the world!! This recipe is a very easy, no need to be professional, a little sleight of hand and you're crepier! So, without doubt, give a try!!! 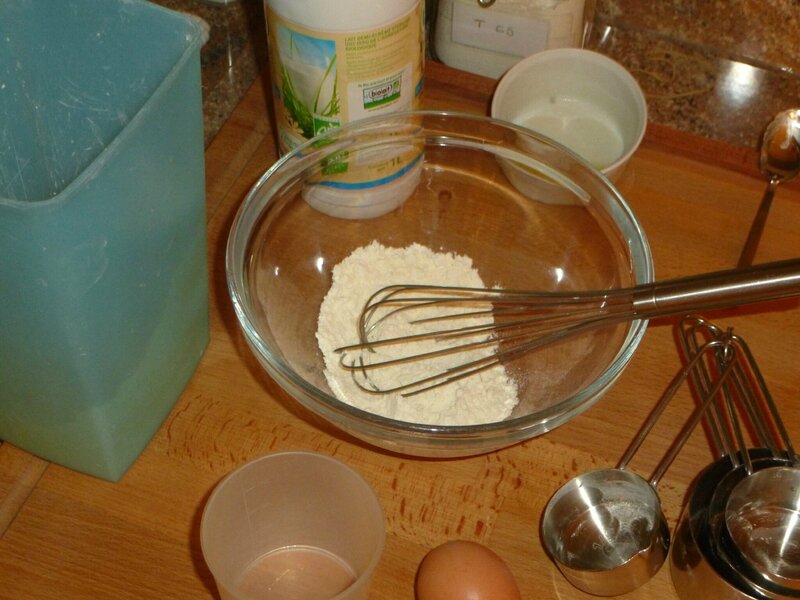 Place the water, milk, eggs and salt in a blender. Add the flour, then the butter. 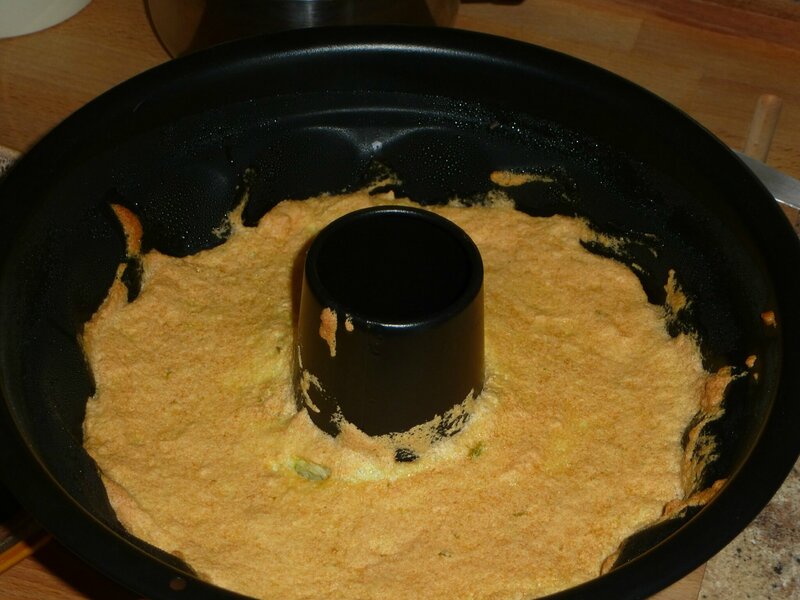 Cover and blend at top speed for 1 minute. 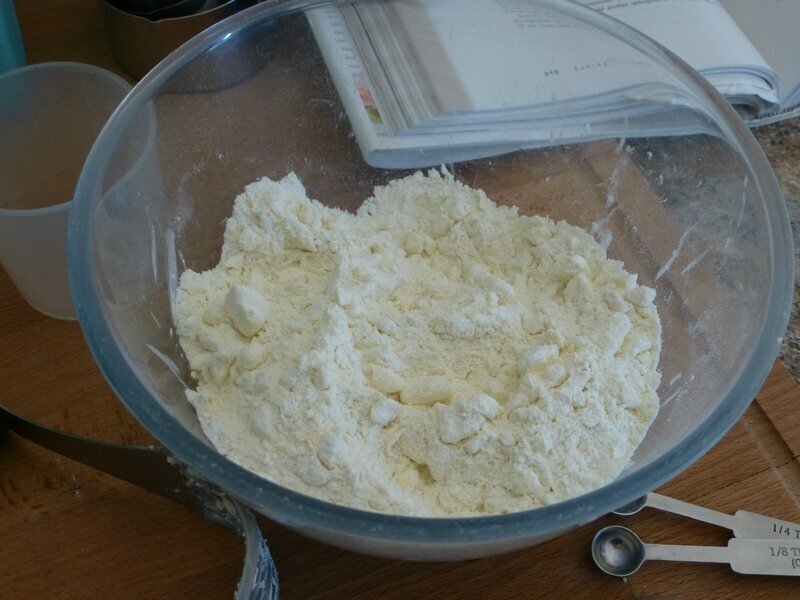 If bits of flour adhere to the sides of the blender jar, dislodge them with a rubber scraper and blend for 2 to 3 seconds more. 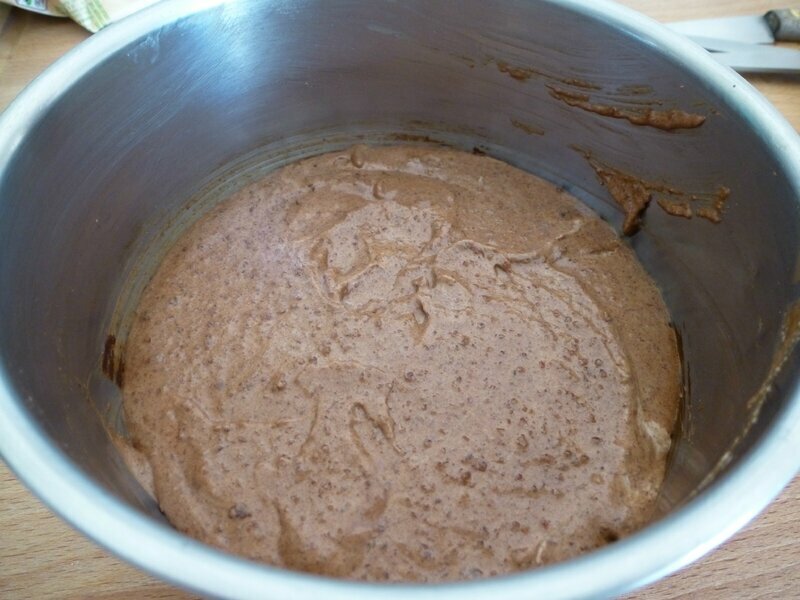 Cover and refrigerate the batter for at least 2 hours. Brush a skillet lightly with the oil (or rub it with the bacon fat). Heat it over medium-high heat until the pan is just beginning to smoke. Immediately remove the pan from the heat, and, holding the handle of the pan in your right hand, pour with your left hand a scant 1/4 cup of batter into the middle of the pan. 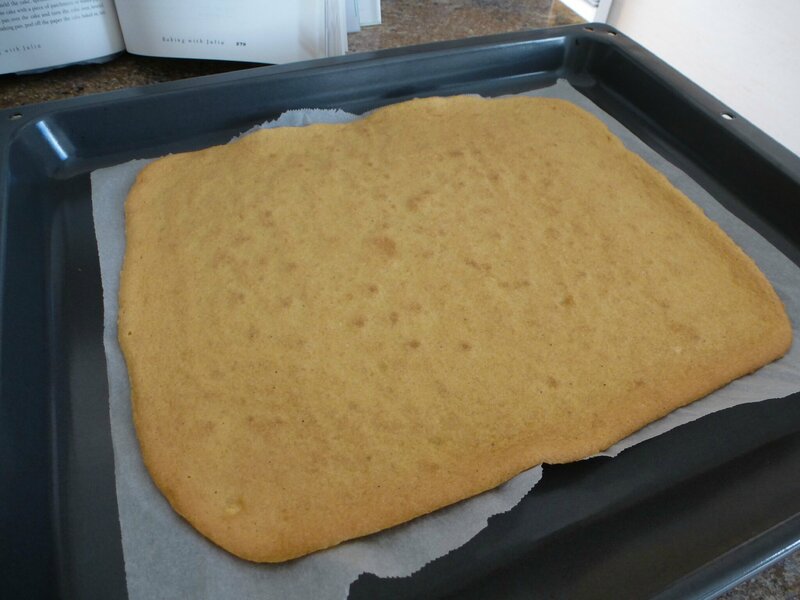 Quickly tilt the pan in all directions to run the batter all over the bottom of the pan in a thin film. (Pour any batter that does not adhere to the pan back into your bowl; judge the amount for your next crepe accordingly.) This whole operation takes 2 or 3 seconds. 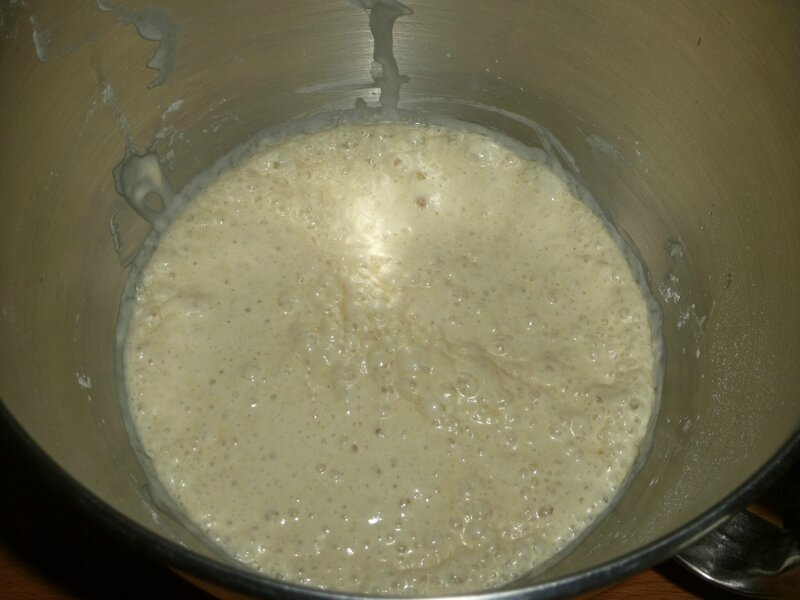 The batter should be a very light cream, just thick enough to coat a wooden spoon. If, after making your first crepe, it seems too heavy, beat in a bit of water, a spoonful at a time. Your cooked crepe should be about 1/16 inch thick. Return the pan to heat for 60 to 80 seconds. Then jerk and toss the pan sharply back and forth and up and down to loosen the crepe. 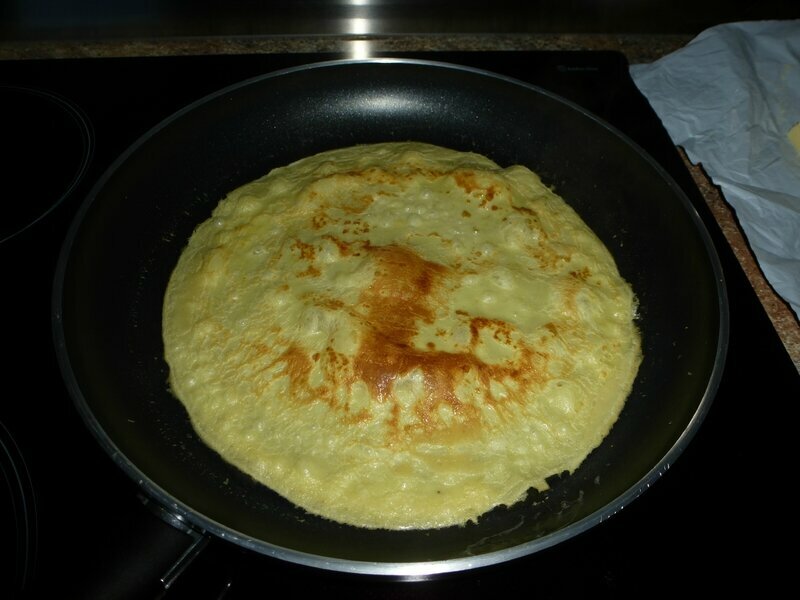 Lift its edges with a spatula, and if the underside is a nice light brown, the crepe is ready for turning. Turn the crepe by using two spatulas; or grasp the edges nearest you in your fingers and sweep it up toward you and over again into the pan in a reverse circle; or toss it over by a flip of the pan. Brown lightly for about 30 seconds on the other side. This second side is rarely more than a spotty brown, and is always kept as the underneath or nonpublic aspect of the crepe. Slide the crepe onto the plate. Grease the skillet again, heat to just smoking and proceed with the rest of the crepes. As soon as you're used to the procedure, you can keep two pans going at once and make 24 crepes in less than half an hour. Crepes may be kept warm by covering them with a dish and setting them over simmering water or in a 200-degree oven. Or they may be made several hours in advance and reheated when needed. Tuesdays With Dorie – Vanilla Chiffon Roll. 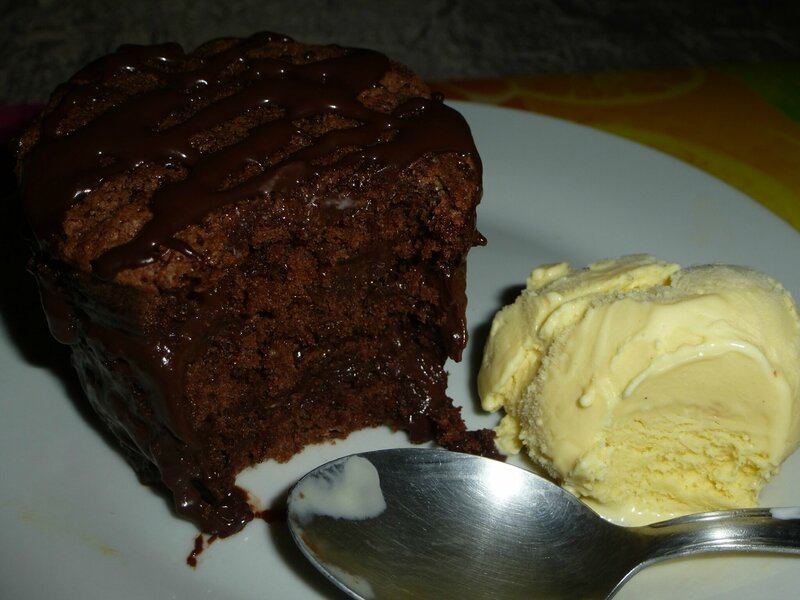 This week, the recipe called for a little more work, not complicated, with a little planning and a little waiting time in the fridge, you obtain a very generous and delicious dessert! The Chiffon Vanilla Roll, recipe chosen this week, is divided in three part : the cake, the mousse and the rolling/chilling time. The Vanilla Chiffon Roll was a success, which was appreciated by all my family!! 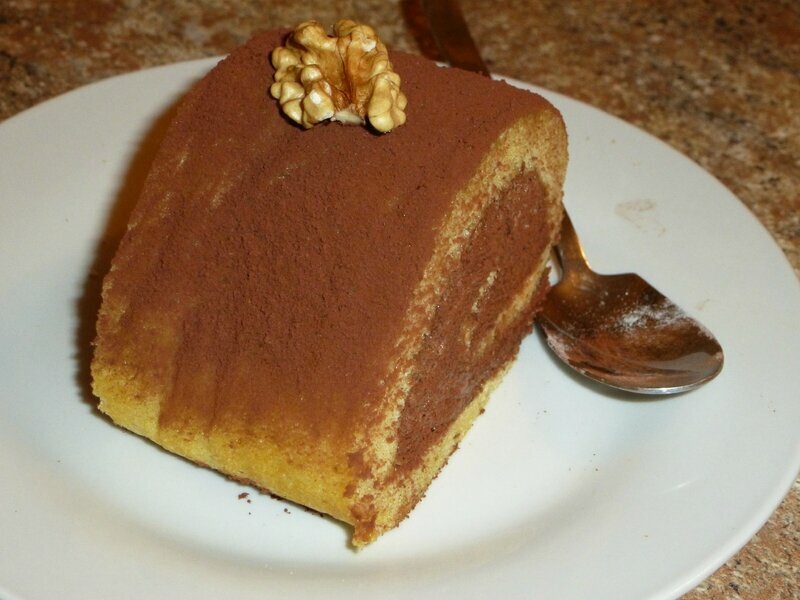 A nice dessert, with a good balance between the cake and the mousse. 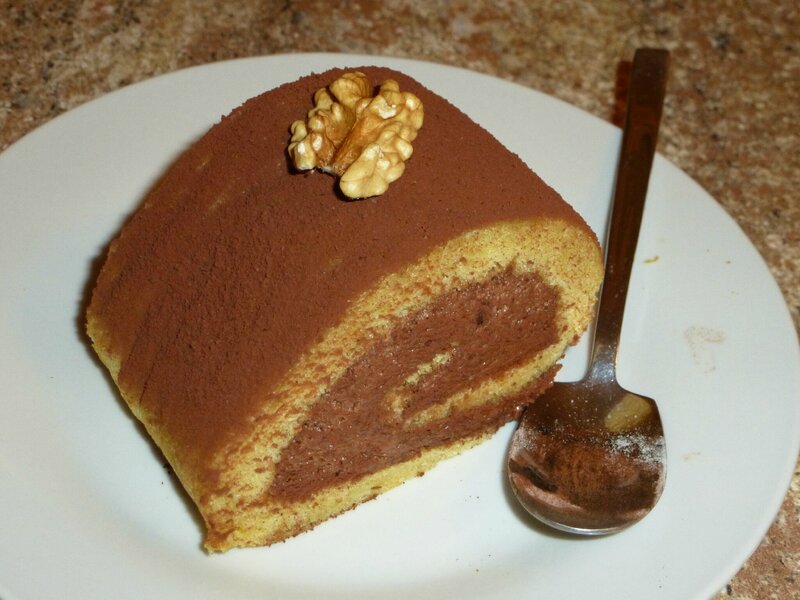 The mousse was full of flavors, due to the chocolate and nuts mix. It gives a very particular taste to the entire dessert… all asked me about the ingredients…. And all asked me for another piece…so…. 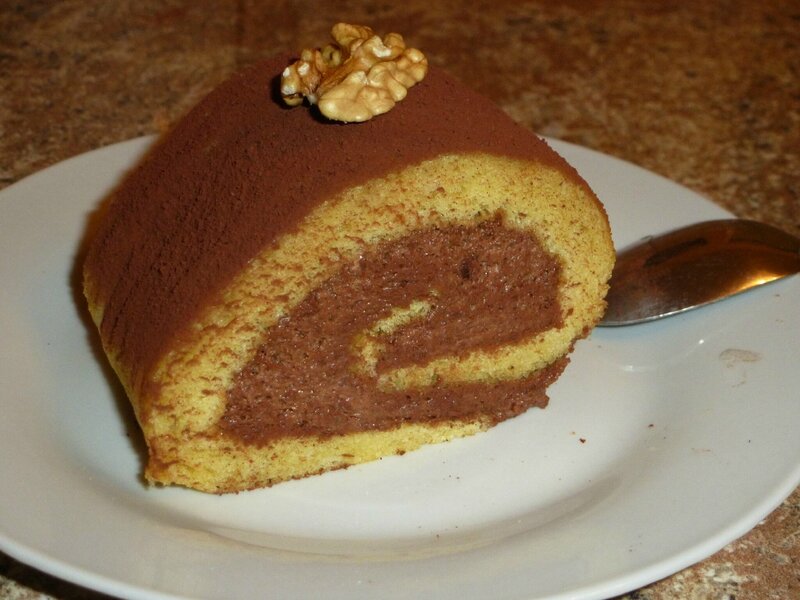 Finally, The Vanilla Chiffon Roll was a great dessert, lovely to serve for lots of occasions!!!! You will find the recipe in Dorie’s book “Baking with Julia” p.277-279. 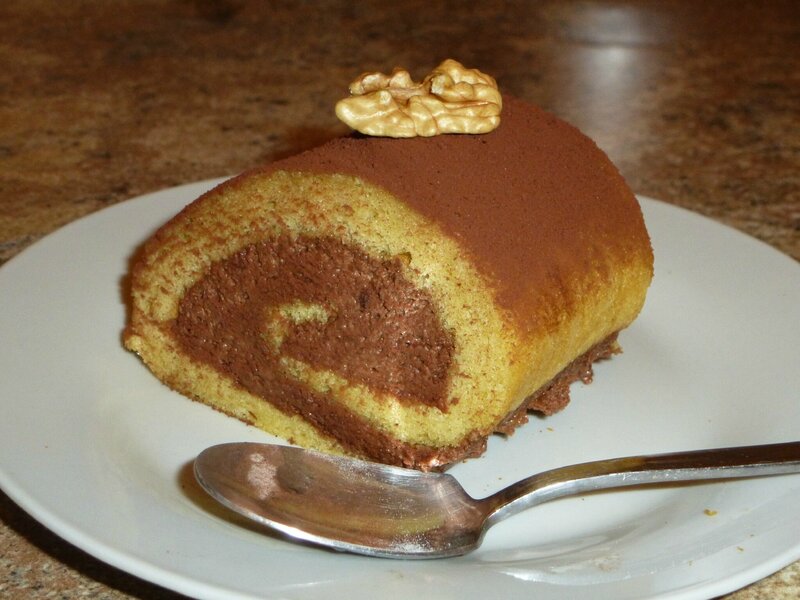 To see what the other members thought of the Vanilla Chiffon Roll visit the BWJ website. 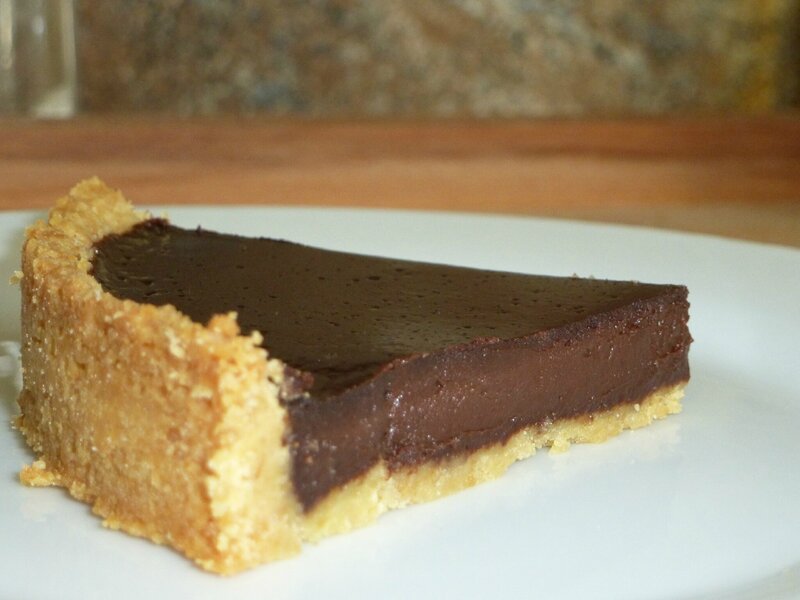 The Simple Chocolate Whiskey Tart with Whiskey Whipped. It's been a while that I follow the delicious adventures of the group' "Baked Sunday Mornings". 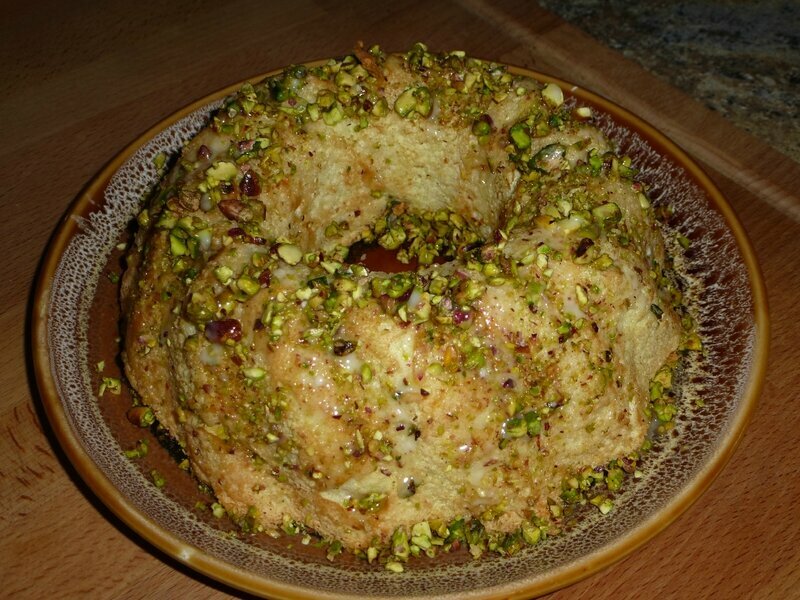 Lot of attractive recipes, so why let them go, and don't make them, in joining to this sweet sundays? I made heaps recipes all over the days and weeks, but most time I forget to take pictures, and then this isn't the recipe chosen by the group. I was scared not having the time to make them. But I have to, it's my resolution for 2014: try to publish more, and by the way, it's so more fun and nicer to cook in group, isn't it? So I run to buy the only copy of the Baked book ("Baked Elements") that I hadn't, and let's go!!!! 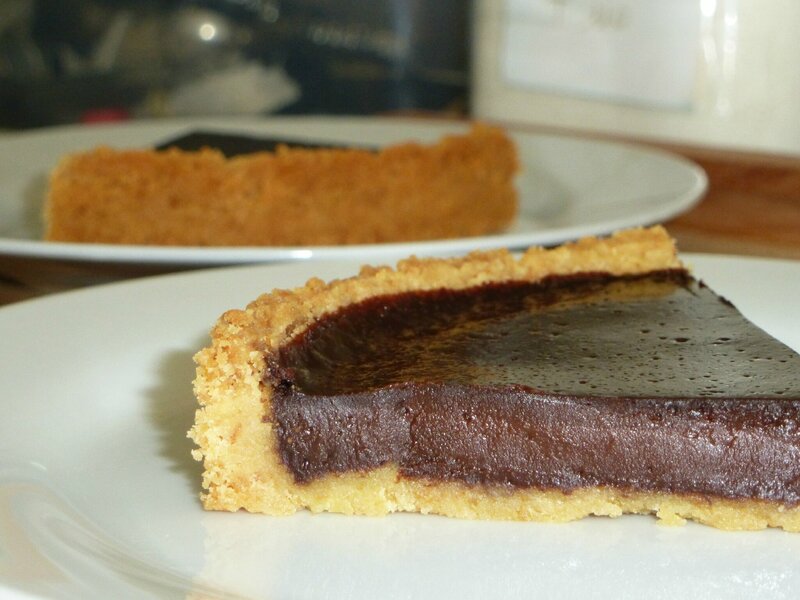 This tart is quite simple to make, you need just some usual ingredients. But I have to say, I had some troubles with the pie crust. 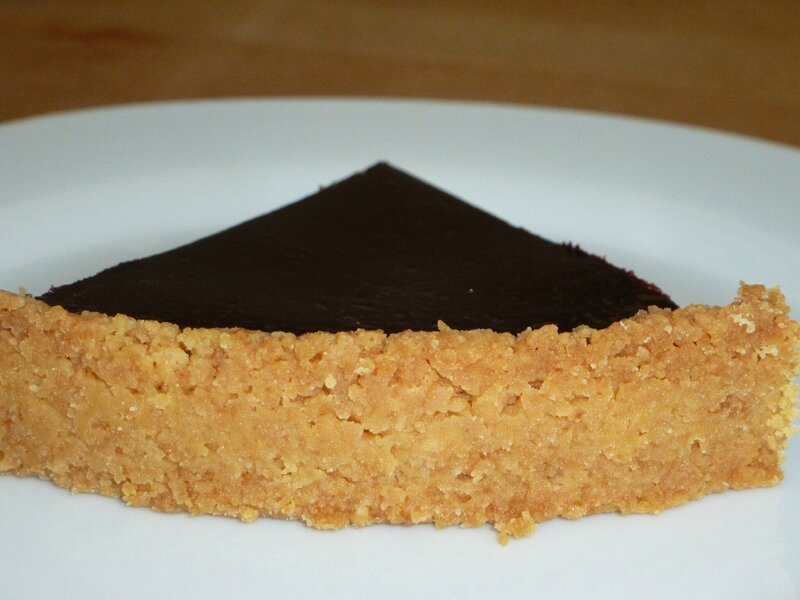 Instead of the pastry crust you typically see in tarts, this time it's a shortbread crumb crust. So I made them and used the classic shortbread (without fleur de sel) recipe of Baked Element, which are absolutely delicious on its own, but there probably to buttery to use in pie crust (much more than those bought in stores which are drier) cause when I start to bake the crust I had a butter flood in my oven!! and the crust seemed unwilling to cook!!! So no panic, no reason to fail this promising dessert, I used some paper towel to keep away the excess of butter and dried the crust….. ouffff!!! It seems to work…. The following has worked very well. 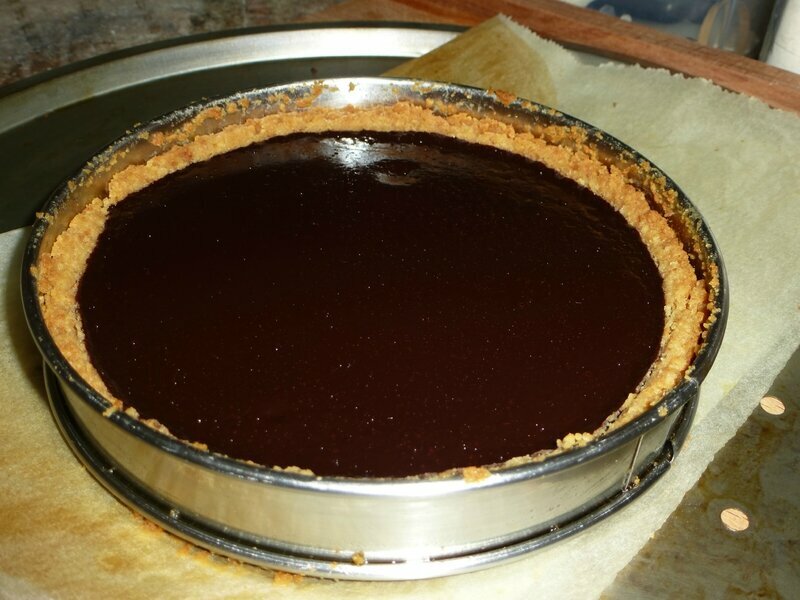 According to my taste I really decreased the amount of whiskey, and I baked the tart only 18’ cause it was set (there was no jiggle at all) and I noticed on the surface some kind of bubbles, I was scared to overbaked. But once I cut my tart all my doubts have vanished, I can see a very melty inside!!! I served with a scoop of vanilla ice-cream. 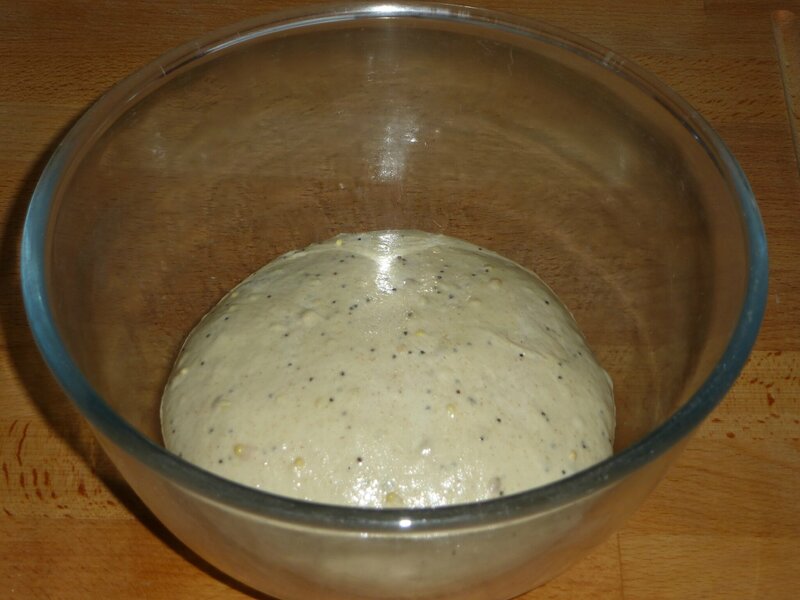 Despite these little crust problems (that no taster could not know…shhhhht!!! ), it was a big hit! And for sure, I’ll make it again!!!!!! Have a look to Baked Sunday Mornings, to see what the other members thought about the Chocolate Whiskey Tart with Whiskey Whipped Cream.